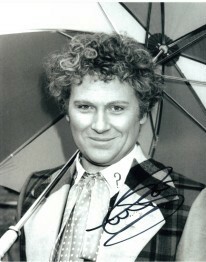 Signed 10 x 8 Photograph of Colin Baker as the Doctor. This is an orginal autograph and not a copy. Baker made his first appearance in Doctor Who as Commander Maxil in the story Arc of Infinity. Baker's performance was described by producer John Nathan-Turner as being "quite arch" and a little sassy. Despite this, Baker's character became one of the few characters to actually shoot the Doctor, then played by Peter Davison. When Baker was officially cast as Davison's successor, he became the only "Doctor" actor to have appeared in the television series as another character prior to taking on the leading role. When Baker was cast to replace Davison, many fans cited that shooting scene in Arc of Infinity, prompting Baker to say jokingly that he got the part of the Doctor by killing the incumbent. Colin is no relation to Tom Baker, who played the Fourth Doctor in Doctor Who for seven years. Baker's first appearance as the Doctor occurred at the final minutes of The Caves of Androzani, where he delivered his first few lines. The closing title sequence for episode four featured Baker's face instead of Peter Davison, and credits him as the Doctor before Davison's own credit. This was the first (and, to date, only) time that the new lead received top billing in the final story of an outgoing Doctor. Baker then made his first full story debut the following week in The Twin Dilemma. It was the first time since 1966, and only the second time in the series' history, that a new leading actor's debut story was shown before the conclusion of the previous lead's season. Baker's era was interrupted by a long 18 month hiatus which was announced in February 1985, mid way through transmission of his first full season. One new Doctor Who story, Slipback, was made on radio during the hiatus. The Controller of BBC One at the time, Michael Grade, criticised Doctor Who, saying that the programme had become overly violent and its storylines farcical during season 22 in 1985. After the 18-month hiatus, the program was brought back for its 23rd season in the Autumn of 1986. Season 23 featured a reduction of episodes produced, and the 14 episode long serial The Trial of a Time Lord was felt by some fans to reflect the fact that the series itself was "on trial" at this time (although the BBC had on many occasions denied that this was the case). In 1986, Baker told an interviewer, "Tom Baker did it for seven years. ... There's a part of me which likes to have a tilt at records. I would like to think that maybe I'd still be doing it in eight years' time." However, later that year Baker was dismissed from the part at the insistence of BBC management, who wanted to refresh the show. BBC1 Controller Michael Grade was alleged to dislike Baker's performance and BBC Head of Series Jonathan Powell has since said that the BBC were looking for "one last chance saloon, for an actor who would take off with the public". He was removed from the part after starring in only eleven stories and just short of three years in the part, making his tenure as the Doctor the shortest in the series at that point. Despite Baker's time in the role being punctuated with numerous personal and professional problems (the death of his son Jack shortly after Baker accepted the role, the 18-month hiatus which followed his first full season and finally his high-profile sacking) Baker remains enthusiastic about his time as the Doctor. He is a regular at conventions and fan events and has returned to the role of the 6th Doctor in numerous audio stories and webcasts, the Dimensions In Time charity special, the video game Doctor Who: Destiny of the Doctors (for which he recorded new audio only) and stage play Doctor Who - The Ultimate Adventure. In recent years, Baker has appeared on a number of DVD releases of his episodes. His turbulent three years on the show are examined in some detail in the documentary Trials and Tribulations, included in the 2008 DVD release of The Trial of a Time Lord.